Sarah Yu has worked in the West Kimberley for 40 years as an anthropologist and curator and heritage consultant. Bart Pigram, a Yawuru man, works at Nyamba Buru Yawuru on cultural and language projects. Sarah and Bart worked on the Lustre Pearling & Australia exhibition at the WA Museum in 2015. 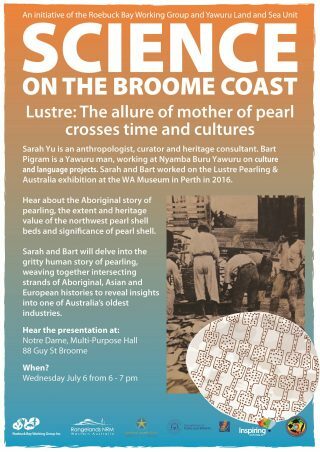 Hear about the Aboriginal story of pearling, the extent and heritage value of the northwest pearl shell beds and significance of pearl shell. Sponsors: Inspiring Australia, Yawuru Land and Sea Unit, WA Marine Science Institution, University of Notre Dame, Department of Parks and Wildlife, Rangelands NRM. Dr Mick O’Leary will present the first detailed analysis of the growth history and evolution of Kimberley reefs over the last 10,000 years, confirming how unique Kimberley reefs are. Corals, canaries & cockroaches: A natural history of Kimberley reefs, Notre Dame Multipurpose Hall, Wednesday, June 29 at 6pm. Free event Gold coin donations welcome. Hosted by Roebuck Bay Working Group and the Yawuru Land and Sea Unit.